Welcome back! Login here to pick up where you left off or to get started on your next project! Send your file to us in a heartbeat by submitting online. 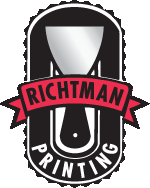 Hansen Printing specializes in thermography or "raised" printing. This process lends a unique design element to your business card. Designs can range in format from basic black & white to impressive, full-color designs.